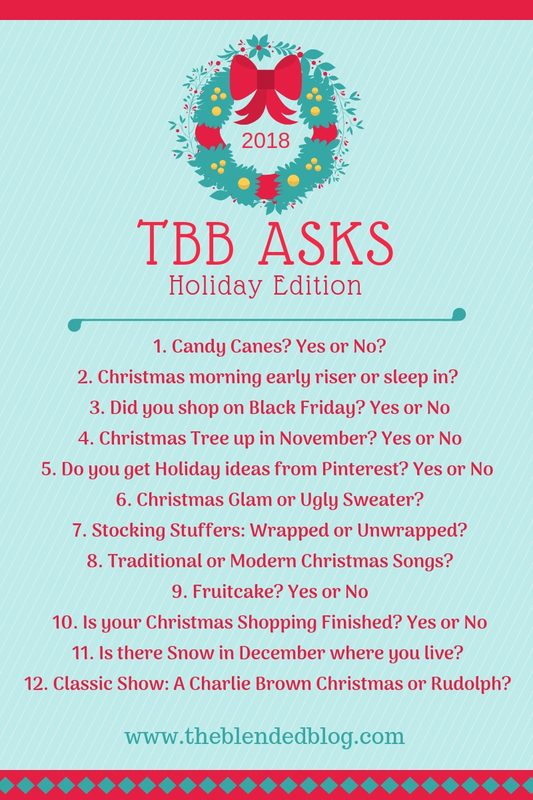 It's time for another round of The Blended Blog Asks and this months theme is everything holidays. I love Christmas so much. From the cozy feeling to the decorations to the lite up tree, it is just amazing. 1. Candy Canes? Yes or No? Yes. I really do love candy canes. From the peppermint ones to the fruit ones, I love them all. 2. Christmas morning early riser or sleep in? Growing up, I would be an early riser. Now I love to sleep in, but my kids don't really let me. 3. Did you shop on Black Friday? Yes or No? No. I hate shopping on Black Friday. 4. Christmas tree up in November? Yes or No? Yes. We always put it up the weekend after Thanksgiving. 5. Do you get Holiday ideas from Pinterest? Yes or No? Maybe Elf on the Shelf ideas, but otherwise no. 6. Christmas Glam or Ugly Sweater? For parties, I go with the ugly sweaters, but Christmas day, I usually dress up. 7. Stocking stuffers: wrapped or unwrapped? Both. I wrap some of them, but leave some of them unwrapped. 8. Traditional or modern Christmas songs? I love the traditional ones. 9. Fruitcake? Yes or No? NO!! So gross. 10. Is your Christmas shopping finished? Yes or No? No. I got a lot of it done on Cyber Monday, but we still need a few things, but not many. 11. Is there snow in December where you live? Most definitely! 12. Classic show: A Charlie Brown Christmas or Rudolph? Charlie Brown. I love them both, but I really do love the Charlie Brown Christmas. I have never thought to wrap anything in the stockings, but I think that would be cute for some stuff! And yes, candy canes all day!! I hadn't either until Rory started doing it for me. Now I do it for some items, but not them all. Such fun! Why do they even make fruitcake anyway...yuck!! Good idea to get elf on shelf ideas from Pinterest. I have no idea, but it is gross. Ha. So fun - totally joining this link up! Love everything holidays. What is sleeping in, right? And we love Charlie Brown over here, too! Me too. It is my favorite time of the year. I wish we could sleep in, ha. I too like all flavors of candy canes. I usually stock up on them when I see them. haha. I never have wrapped gifts that go in the stocking but I'm thinking maybe I should wrap a few. It is a tradition for us too. I could do without the cold too! So funny how so many of us are answering no way to black friday shopping! I think we know online shopping is where it's at! Oh it is totally where it is at. I hate shopping in the stores now. I will send you some!!! I put my tree up after Thanksgiving too. Ugh send us some snow, it was 80 this past weekend. Doesn't feel like Christmas! I just got Gabbie an ugly Hanukkah sweater, lol! Oh I bet that is going to be the best!!! I just actually tried fruit cake for the first time recently and it was DISGUSTING. How do people eat that stuff?! I have no idea. I hate it soooo much! I am with you on the Black Friday thing…NO THANKS! I’d rather not lose my sanity. Haha. Send some of that snow to Texas. Oh I will send you some!!! I hate Black Friday shopping and the crowds. lol I love your response to the fruit cake.. I agree so gross! Ha! From what I'm seeing, the fruit cake question answers are my favorite to read!!! Haha mine too. They are almost all alike. I haven't found one person who likes it. Yes to candy canes! I haven't had one yet this season - think that needs to change! I haven't either! That definitely needs to change. I also did a lot of shopping on Cyber Monday - the deals were so good. Have a wonderful week! That is when I did most of my shopping too!!! I hope you have a wonderful week as well! The thought of black friday shopping stresses me out haha! I only did it once and I vowed never again. It's just too much chaos. We do a mix of both wrapped and unwrapped stocking stuffers too. I am not a fan of black Friday shopping either! Too crazy!